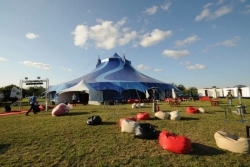 RJCC Events have produced a number of festivals over the years, supplying everything from fencing, staging and trackway to luxury toilets, portaloos, showers, glamping tents, generators, site lighting and of course stage lighting and sound. We can production manage your event from start to finish with concept and design to logistics, installtion, operation, dismantle and debrief. 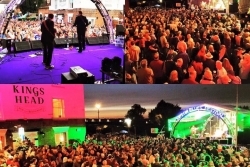 We own d&b line array PA systems and Martin, Robe and Clay Paky lighting equipment which, together with our highly enthusiastic and experienced team of sound engineers and technicians, sets us well above the competition with fantastic prices. We can even recommend sites for your event, or if you have land or a field you can leave the rest up to us! Field Maneuvers 2015 from Field Maneuvers on Vimeo. RJCC Events provided lighting and lasers for the main tent along with many miles of cable, festoon lighting for Field Maneuvers Festivals over the past few years.